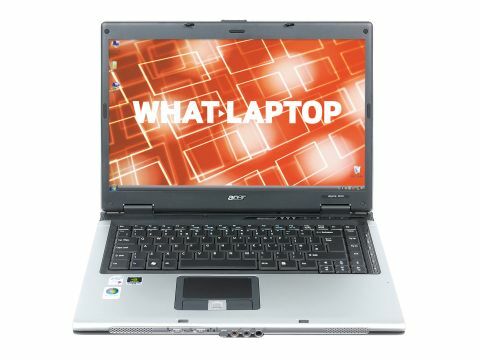 The Acer Aspire 5613AWLMi (£499 inc. VAT) is a staple of the range that is aimed at home users looking for a laptop to use around the house rather than on the move. The chassis is used in a number of different price configurations, so while you'll find a switch on the front for Bluetooth and wireless LAN, at this price only 802.11g Wi-Fi is actually installed. Weighing in at 2.8kg, it's a fairly portable machine, but with a battery life of 150 minutes, you won't want to rely on this system for long periods of the day. The design is the older 'Folio' look, rather than the new 'Gemstone' design and looks a little corporate. With a base made from plastic throughout, this is a robust and solid laptop that comes with firmly attached screw hinges. At this price point you'll find the main specification offers great value for money. The processor is a dual-core chip, but is part of Intel's first-generation Core Duo processors, so isn't as fast as the latest chips. However, with 2048MB of memory you'll find applications load and run smoothly. We were even impressed with the 160GB hard drive at this price. The screen is a good size, measuring 15.4 inches and comes with a Super-TFT finish. The screen delivers bright images, but we found it needed to be turned up to its brightest setting to get the best from the panel. The screen is supported by the Nvidia GeForce Go 7300 graphics card, which is a dedicated card. As it uses an older technology, it isn't designed to use DirectX 10, so won't be able to handle any of the latest games or applications within Windows Vista that use this extension. With a Windows Experience Rating of 3.2 you won't be able to run the Aero interface on this system, but we found Windows loaded quickly and ran smoothly. The keyboard is a good size and while the keys have a reasonable amount of travel to them, we found the central keys were higher than those on the side. This is due to the clip mechanism holding the keyboard in place - it pinches the sides, but leaves the centre loose. This isn't a design flaw, but means the keyboard may well develop a bounce to it over time. The only real problem we had with this machine was the use of Windows Vista, as it took longer than it should to set up. Even then we found we had compatibility problems. This may not be a problem if this is your first computer, but if you have older peripherals, make sure they work with Vista. The Acer Aspire 5613AWLMi offers great value for the price. While it isn't cutting-edge, it will serve you well for the next few years and is a laptop well worth considering.